It all began simply enough. In 1976 the Point Reyes Wilderness Act granted the highest protection in America to more than 33,000 acres of California forest, grassland and shoreline - including Drakes Estero, an estuary of stunning beauty. Inside was a small, family-run oyster farm first established in the 1930s. A local rancher bought the business in 2005, renaming it The Drakes Bay Oyster Company. When the National Park Service informed him that the 40-year lease would not be renewed past 2012, he vowed to keep the farm in business even if it meant taking his fight all the way to the Supreme Court. Environmentalists, national politicians, scientists, and the Department of the Interior all joined a protracted battle for the estuary that had the power to influence the future of wilderness for decades to come. 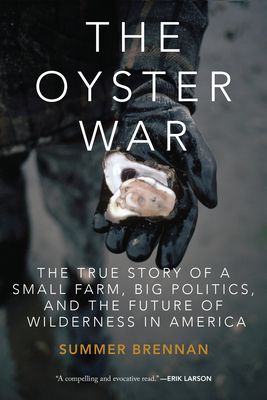 Were the oyster farmers environmental criminals, or victims of government fraud? Fought against a backdrop of fear of government corruption and the looming specter of climate change, the battle struck a national nerve, pitting nature against agriculture and science against politics, as it sought to determine who belonged and who didn't belong, and what it means to be wild. Summer Brennan was born to parents living in a houseboat on the San Francisco Bay. She has written for magazines and newspapers all over the country and works regularly with the United Nations Press Office in New York covering issues related to decolonization, disarmament, human rights and the environment. As an undergraduate at Bennington she studied with Mary Oliver. Later she took her masters from NYU in journalism and the Middle East. The Oyster War is her first book. Learn more at theoysterwar.com.